HP Folio 13 is a stylish and well-designed ultrabook which is launched by HP with an intention to compete with Apple Macbook Air. The company wants to target business user with the launch of a device which is combined with high end specs and features. The battery of this laptop offers 9 hours of usage and truly it is a feature which is desirable by laptop users. HP will release Folio 13 on 7 December with an affordable $900 price tag. HP today introduced its first business Ultrabook™, which features a thin and light design, strong security options and a responsive solid-state hard drive for the ultimate mobile experience. The HP Folio13 also delivers up to 9 hours(1) of battery life, the highest performance available among Ultrabook devices currently on the market. With the battery life to get them through the workday, users are no longer saddled with carrying power adapters to charge their notebook PCs. Plus, a wide array of ports, including Ethernet, eliminates the need to carry dongles. Mobile professionals can now stay productive and get through their entire business day – from home to business and back home – with only the HP Folio13. Measuring less than 18 millimeters thin and using an ultraslim 13.3-inch diagonal high-definition (HD)(2) BrightView display, the HP Folio13 weighs just 3.3 pounds. (3) It combines the cool industrial design found on consumer products with the security and usability business users demand. Powered by the latest Intel® Core™ processors,(4) the HP Folio13 also includes Intel Rapid Start Technology, which helps save time by getting users systems up and running fast. The HP Folio13 includes a backlit keyboard for mobile users who work in low-light conditions. A full array of ports, including RJ-45 and USB 3.0, allows users greater flexibility to connect to the information they need. The HP Folio13 also includes a solid-state drive (SSD) with 128 gigabytes (GB)(5) of storage for fast response times and increased reliability. The HP Folio13 features HP CoolSense technology, which uses advanced hardware and intelligent software for a noticeably cooler notebook. The notebook also includes an HP ImagePad for highly accurate, advanced multitouch gesture support. Additional features include an HP TrueVision HD Webcam(2) for brighter, cleaner HD images, and Dolby Advanced Audio. 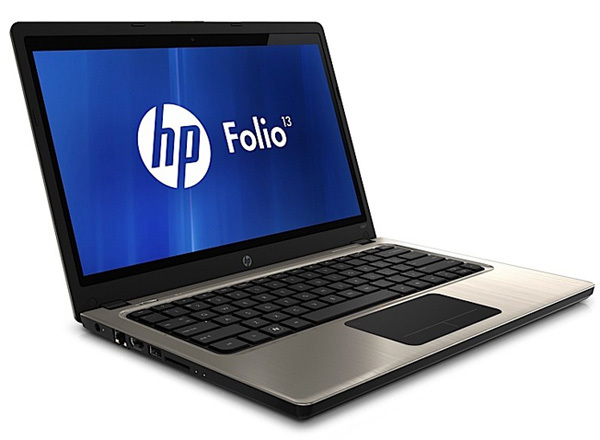 The HP Folio13 also can be configured with a range of Microsoft Windows® 7 operating systems, including Windows 7 Professional. A three-year limited warranty is available through an optional HP Care Pack. Additional information is available at www.hp.com/personal and http://shopping.hp.com/go/newfromhp. HP also introduced new HP ENVY and HP Pavilion dm4 notebook PCs. More information is available at www.hp.com/go/newsroom.